Every organism who is a part of this world needs to eat in order to grow and survive. They derive energy from it to perform their daily tasks. Like we humans need food, other living beings also need some form of sustenance to go about their work. Animals also require food like us to live and survive. This also includes our pets. We bring them into our homes, and they become a part of our families. And we make sure that they get every comfort that we as humans enjoy. So, keeping the eating requirements of dogs in mind, someone invented dog food. It is made with a balanced plan for the nutrients so that your canine gets everything in the correct amount for the day. But some of us also feel that this packed dog food is somehow still not enough for them and that we need to do something on our level to ensure that they are getting their fair share of essential nutrition. If you wish to get the best dog food for your pet that you can be sure will do only good for them, then these homemade dog food recipes are entirely yours to give them a try. What is the Ideal Dog Food? Before the list, we need to understand the contents of what makes ideal dog food. And we are also required to know that, just like human babies, puppies also require a different diet than adult dogs. They need special food items that help their bones and organs in their growing stage so their health benefits from all the nutrition that they are getting. Also, depending on their breed, they need this diet for a period of 9 to 24 months. If you need, you can give your adult dog a special meal, too, in cases like maintaining weight or keeping their strength with age, etc. Now that we know how much of a specific nutrient our dogs need, we can go on and create recipes that can be prepared at home for them. For those of you who believe that the packaged dog food is not enough or does not make the cut to the healthy dog food, you now have the choice of preparing your own dog food in so many different ways. You can create something that your dog will not only like, but will also benefit hugely from. Plus you also get the satisfaction of knowing which ingredients were exactly put in there. You will sort through the constituents yourself and choose what goes in and what doesn’t. Here is a list of some homemade dog food recipes that you should surely give a try too. To make this, take a large saucepan and fill it with about 3 cups of water. In this water, cook the rice as per the instructions given on its packet. Keep them aside. Next, take large stockpot or a Dutch oven, and heat the olive oil in it over some medium heat from the stove. To this, add the ground turkey and cook it for a good 3 to 5 minutes, until it turns entirely brown. Also, ensure that the turkey has been properly crumbled while you are cooking it. Add this to the spinach, carrots, zucchini, peas, and brown rice. Cook this until the spinach has completely wilted, and the mixture has been wholly heated, for about 3 to 5 minutes. Let the meal cool down entirely before you proceed any further. Another advantage of making this recipe comes into play now. 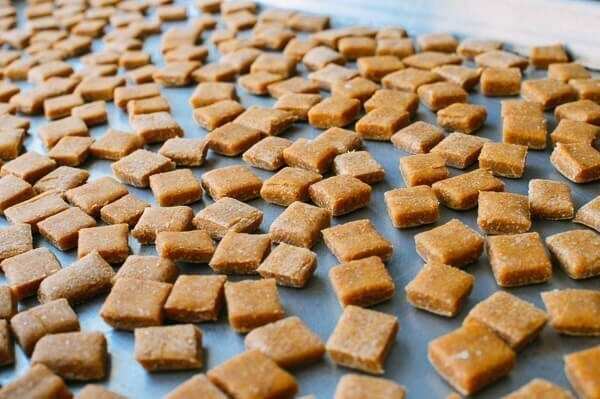 You don’t have to force your dog to eat the entire batch. You can easily divide it up into servings and freeze them with the date mentioned on the container. Whenever you have to serve it, just thaw it in the fridge overnight and heat it up for 15 to 30 seconds. The preparation is easy, and the recipe has many benefits too. 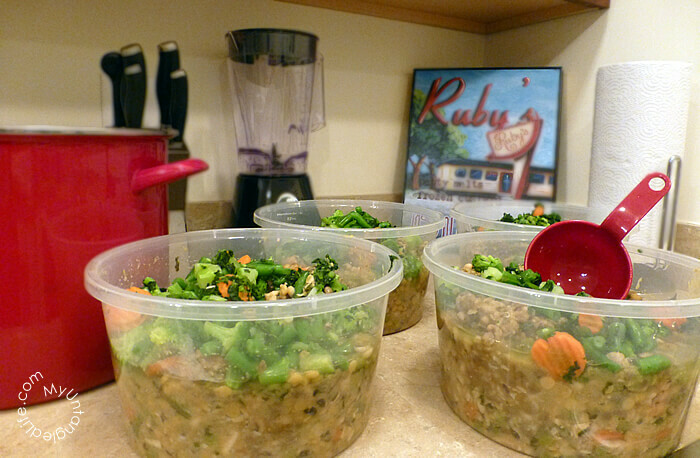 Also, the balance of this recipe is fascinating, with 50% of protein, and 25% each of veggies and grains. If you wish, you can alter this balance to suit the breed and need of your dog. To make this beef stew, begin by sauteing it in a large pot to the point it is no longer pink. Do not take out the fat from the meat as it is the right kind of fat for your dog. If you wish to use a little leaner meat, you can add about two tablespoons of coconut oil, so your pet gets some fat. After that, add potatoes and carrots to the meat. Add water in amounts just enough to cover the vegetables in the stew and let it boil before letting it simmer for around 20 minutes. Or you can make it simmer till the veggies are cooked. In this, add the frozen peas. If you want, you can also add a small amount of sea salt, so the food does not remain entirely bland. Allow the preparation to cool before serving it to your dog. You can serve your dog with whatever amounts you wish, or they prefer and refrigerate or freeze the extra portions. It takes up a total of or lesser than 35 minutes to make. The reason that this recipe has options like using turkey or chicken as alternatives to beef is that it is good to have a little bit of change. Plus, if beef is not available or if you feel that the produce is not fresh, you can replace it with any other meat item which suits you. You have to begin this process by preheating the oven to 350 degrees. Take a large bowl and mix flour, baking powder, and the egg. To this, add the peanut butter, water, and honey. Stir this mixture until you have a firm and sticky cookie dough. You may even have to use your hands or the paddle attachment that comes with your mixer. Take a flat surface and flour it. Roll the dough on this surface until it is about a half inch in thickness. With the help of a cookie cutter of a shape of your preference, cut out the shapes that you like. Since the cookies would not rise or expand much, you can let your creativity get the best out of you. Bake these in a pan for about 20 minutes, or till they turn golden. You can keep them stored in an airtight container for your dog and give them to it on the meal time. 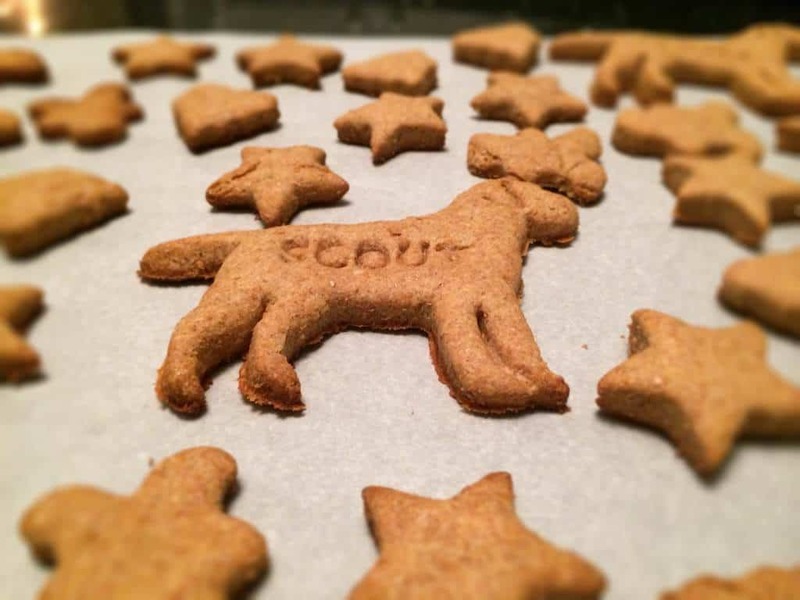 Another brilliant thing about the cookies is that they make fantastic gifts for your fellow dog lovers. People will love these cookies, and they will just adore you. Some people have noted that dogs may or can be allergic to flour or wheat. If that makes you unsure of this whole recipe, you can replace flour with rice or coconut flour. It works brilliantly, but you might end up with a little different consistency. Nonetheless, your dog will still love it immensely. 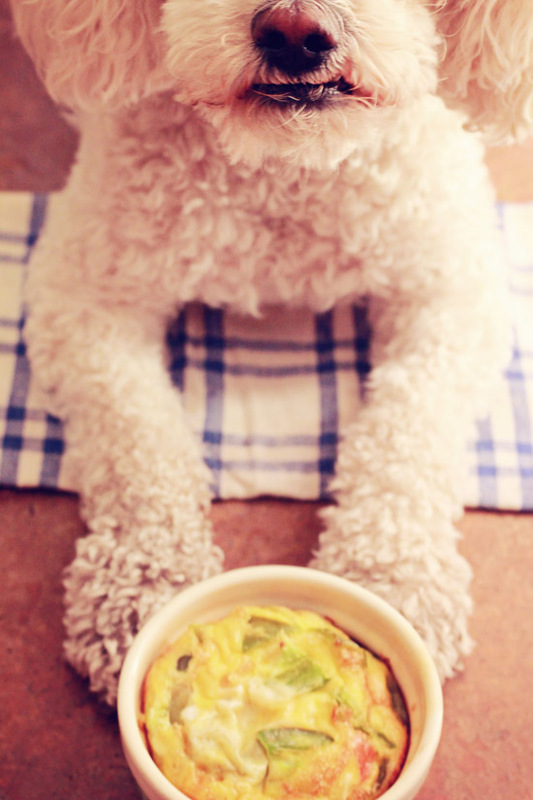 For making mini omelets as a treat for your dog, start by lightly greasing the ramekin with a small amount of olive oil. Crack the eggs straight into the ramekin. Add the green pepper and salmon into the eggs, and stir the mixture until they get thoroughly combined. Stick this into the oven to bake at 350 degrees for a duration of 10 to 12 minutes. Or, you can check for the top to get brown and the omelet to be cooked thoroughly. Allow this to cool before you serve it to your dog. You can make this on really short notice, and your dog(s) will love it. A whole batch of omelets can be prepared if you are having a party at your place on a Sunday afternoon and you expect a lot of dog owners to be there. There is no need to be tensed by thinking that this is a static recipe as you cannot replace the ingredients. If your dog, or any other dog for that matter, does not like the green pepper, you can swap them with tomato, broccoli or shaved smoked ham, whichever you know that the pets would be delighted to have. One thing you will have to be a little cautious about is to ensure that the egg is thoroughly cooked. Uncooked eggs can cause problems with your dog’s system, rendering them with issues of the skin and coat (3). You can also make the omelet bite-sized if you wish. Just cut it into small pieces once it has cooled. Take a double boiler and pour about one and a half cup of water into it. In a steam basket, put the carrots in it, place it over the pot, and cover it. Heat the water until it is boiling, followed by reducing the heat to low. Steam the carrots until they begin to get tender, which will take around 10 minutes. Meanwhile, you can take the turkey and chicken liver to a skillet and cook them over medium heat until they are ready, or there is no more pink left. Drain and trash any fat that you find in the meat. To the steam basket, add the broccoli, cauliflower, and zucchini, and let them steam until all the vegetables become tender, but try not to make them mushy. This process will complete in around 6 to 8 minutes. Let these veggies cool down a bit, after which you will have to chop them. You can use a simple food processor or take them to the knife, whatever you are suitable with. The sizes you cut them up in will have a significant effect on the consistency of the end product. The usual process is to give the vegetables about three pulses and bring it to a consistency similar to what we usually see in canned products, finely chopped. Add these veggies to the turkey and liver. Stir this until they are appropriately combined. Add some olive oil and toss the contents of the skillet to mix them properly together with the oil. Let it cool before you divide them into serving sized containers for storing in the freezer. Take your dog to the vet to know how much food should their every meal have. Defrost the food in the refrigerator one night before serving. You have to begin by boiling the potato in the oven. Boil it till the inside of it also becomes softer. The procedure will take about 8 to 10 minutes. After that, take a mixing bowl and mash the sweet potato with the banana. Add the carrot, wheat flour, and the rolled oats to the prepared mixture. Then, add the applesauce and water slowly into the mix. Make this mixture into a dough. Being to roll the dough after sprinkling some flour on a flat surface. You have to maintain the thickness of about one-eighth of an inch for the dough. With a regular knife, cut the dough into strips and line them up on a baking sheet placed over a pan. Stick this pan in the oven and bake the strips for a maximum of half an hour. Let them cool for a while before serving them. If you got a few pieces left over, you need not worry as these strips can be conveniently stored in the refrigerator for around two weeks, or even more. Take a large 6-quart dutch oven and cook all the three types of ground meats together in it. Now, add the rice chicken broth and water to it, cooking it all together on medium heat for about 30 minutes. To this, add the potatoes, carrots, and the beaten eggs. Cook all of this for an extra 20 to 30 minutes. Let it cool for a while, followed by pouring it into storage units, and keeping it in the freezer. This mixture freezes really well, which makes storing it really easy. Whenever you wish to serve it, thaw it overnight in the fridge. Depending on the diet of your pet, dog food can cost a lot. And it still is not the best thing they can eat. Just like us humans, no two dogs are the same. Every dog needs special care and attention in matters of diet and food. If taken lightly, it can have hazardous effects. A little thorough research yourself, and a trip to the vet will help you a lot in understanding what your dog cannot directly tell you in words. Maybe the packaged dog food that you serve is not complete, and the dog does not like the way it tastes. These are things that your pet would not be able to tell, but you will have to figure out on your own. 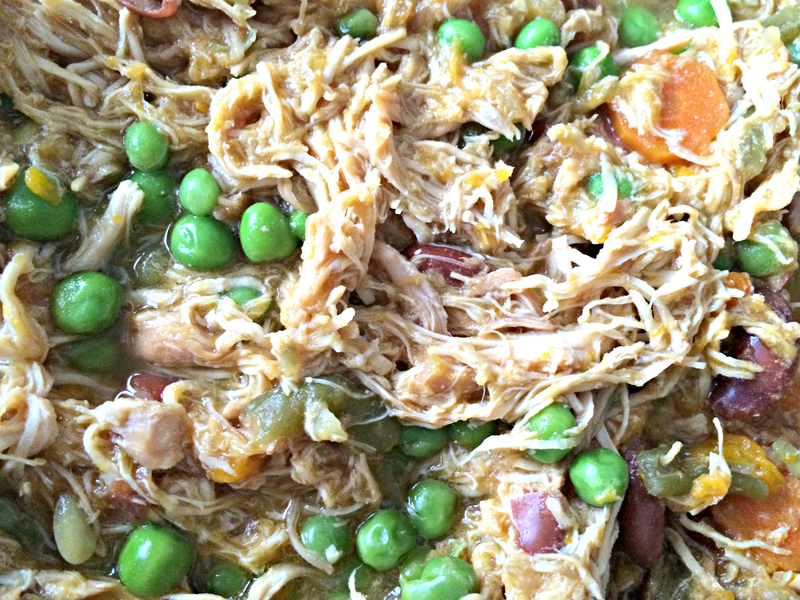 Take a crockpot and put the chicken in it. Now, pour just enough water in the crockpot that it just covers the meat. Follow it by adding the rest of the ingredients – potato, carrots, kidney beans, green beans, and apple. Cook the mixture on a lower setting for about 8 to 9 hours. When it is done, add the frozen peas in the pot and cook for 30 minutes more. Drain off the excess water in the pot and add some olive oil. Stir using a spatula to mash them together using a food processor. When the preparation has cooled, measure the amount that will make for one serving for your pet and store it in the freezer, packed in separate Ziploc bags. Every night, place a container in the refrigerator so it can thaw overnight and be ready in the morning. You can also throw in a multivitamin, so the dog food too supplements for your pet’s calcium needs. This will be a particularly helpful factor for both – a growing and an aging dog. The whole recipe is about just three products. That is all the ingredients which you require for making chicken jerky strips. Firstly, preheat the oven to 170 degrees. Take away any extra fat and bone bits that you see on the chicken and dry it by patting. Mix the soy sauce and peanut butter in a separate bowl to prepare the marinade for the jerky. 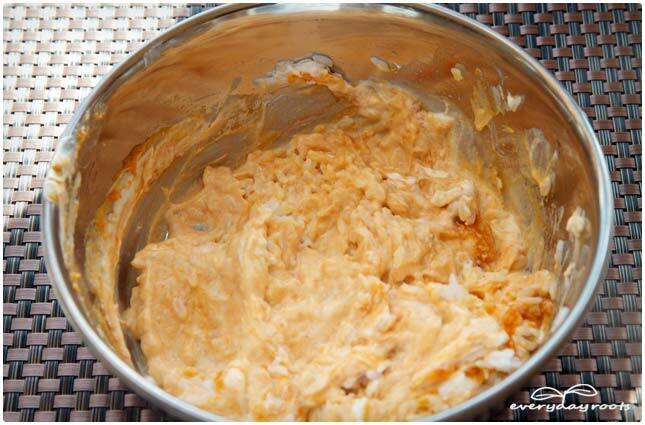 Stir it with a tablespoon of water, so the marinade acquires the consistency of a smooth paste. Coat the chicken with this mixture thoroughly, and keep it in the freezer for about an hour. We have to do this because a slightly frozen chicken becomes easier to slice. After an hour, take the chicken out and cut it into slices (as thin as you can). 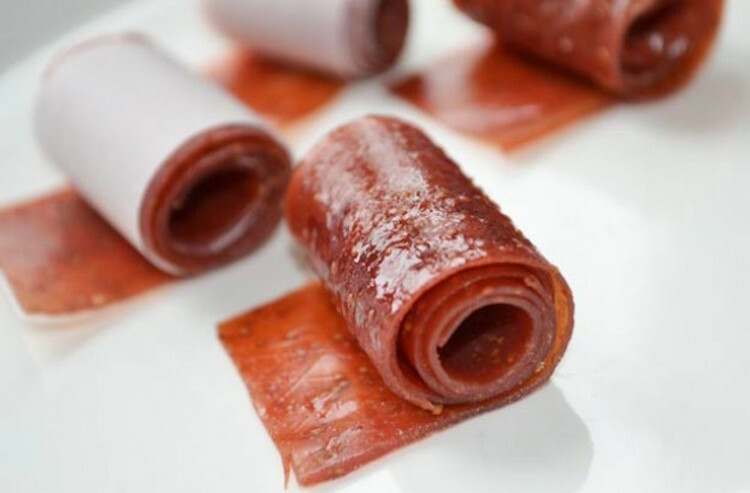 Take a sheet covered with parchment paper and line the jerky strips over it in a single layer. Bake it in the oven, with the timer set for 2 hours. After this duration, your jerky will be ready to eat. After it has cooled down, you can choose to break them into smaller pieces or keep them as it is for bigger bites. You can even store them in containers with seals, and they will be usable until 30 days if not finished before that time. What is even better is that you can also enjoy these with your dog. These are low in fat and have a high protein content, too. As for any biscuit, you will have to prepare your oven. Preheat it to 350 degrees. Take a large bowl, put in the pumpkin puree and the eggs. Mix these two together with the help of a fork. Add the flour, salt, and milk, mixing them well into a dough. You might notice that the dough is a little stiff, so you can add a small amount of water in it so you can work with it easily. On the surface you are to work, sprinkle some flour and roll the dough on it until it acquires a thickness of about a quarter to half of an inch. If you wish to avoid any kind of sticking, sprinkle more flour. Cut them out in whateAs for any biscuit, you will have to prepare your oven. Preheat it to 350 degrees. Take a large bowl, put in the pumpkin puree and the eggs. Mix these two with the help of a fork. Add the flour, salt, and milk, mixing them well into a dough. You might notice that the dough is a little stiff, so you can add a small amount of water in it so you can work with it efficiently. On the surface, you are to work, sprinkle some flour and roll the dough on it until it acquires a thickness of about a quarter to half of an inch. If you wish to avoid any kind of sticking, sprinkle more flour. Cut them out in whatever shapes you prefer (like the bone shape) and set these about a half inch apart on an ungreased cookie sheet. Bake the biscuits for 20 minutes in the oven, before turning them over to the other side and continue cooking for another 20 minutes. Take them out of the oven and let them cool for a while before you serve them. You begin by boiling the potatoes in unsalted water until they become tender. Allow them to cool first, before you mash them in a bowl. 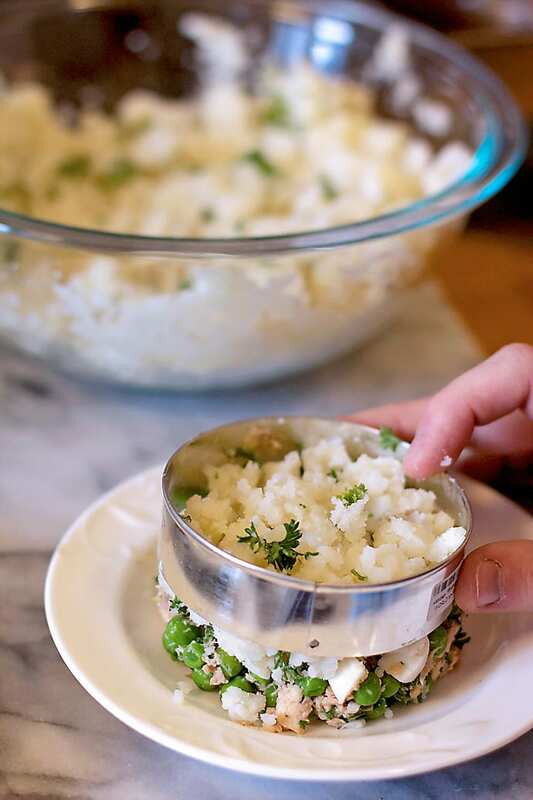 In the mashed potatoes, add about a quarter of parsley. At this point, you may feel that the potatoes are a little dry, but you don’t have to add anything to add moisture to them. Take the peas and cook them as per the instructions given on the package. In a separate large bowl, put in the salmon, tuna, rest of the parsley, hard-boiled eggs, and peas, and mix them all. Now, the next step depends on your choice. You can either mix in the mashed potatoes with the fish mixture and serve them directly after the preparation cools down. Or, you can make the fish into small patties using a cookie cutter, and top it with the mashed potatoes. The size of the patty can vary according to the diet of your dog. You can make them into any shape you prefer and serve them straight to your pet. Got some leftover? Don’t panic; you can store them in the fridge for about three days. Chicken is a fan favorite for any and every meat lover. There is no fixed way for making a chicken recipe, and that is why it is always a brilliant experience to indulge in a tasty dish. And if we can enjoy chicken and praise it by saying so many words, wonder what our pet animals would want to say about it. You should not wait for them to tell you that they love chicken with the same intensity as you, probably even more. 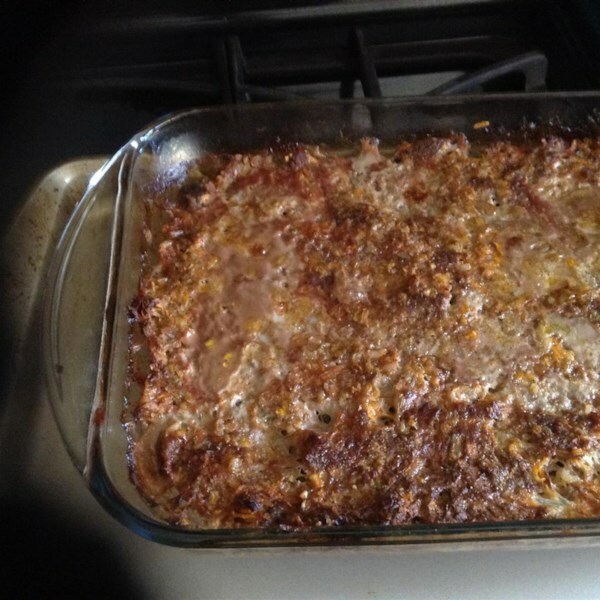 One of the best chicken recipes is definitely going to be the chicken casseroles. Also, your dog will enjoy that too. Prepare your oven by preheating it to 300 degrees. Take your chicken breasts and cut them into bite-sized pieces. In a middle size saucepan, put these pieces and pour water on the top of the chicken is just under the water level. Boil this water and then bring it to simmer. Cover the top of the saucepan and let the chicken simmer for about 30 minutes. Cook the rice in a separate saucepan or a steamer. For every cup of rice put, use about one and a half cup of water. In another saucepan boil the potato in water and then let it simmer in the water for about 20 minutes or till it becomes soft. As soon as these three are adequately cooked, take a large mixing bowl and mix all the components with each other and the rest of ingredients; peas, carrots, pumpkin puree, chicken broth, and celery. Stir them all, so they get appropriately mixed. Take this mixture and pour into a casserole dish. Put this dish in the oven without the lid on and bake for a good 20 minutes. Take the casserole out of the oven and let it cool to room temperature. You can serve it directly or store it in the freezer to provide variety for your dog’s weekly meals. Since this is a baking recipe, you will have to preheat the oven to 400 degrees. Take a muffin tin and spray the insides with Pam or lightly brush on some cooking oil. Taking a large bowl and mix all the ingredients thoroughly. Form this mixture into twelve equal sized balls and place one in each of the muffin tin. Sticking this into the oven, bake them for about 20 to 25 minutes. Let them cool down for a while before you serve them, and if there is any left over, you can easily store it in a container with a seal in the fridge, and they won’t go bad. To make any kind of loaf, you will need to bake it. So you begin by preheating the oven to 350 degrees Fahrenheit (175 degrees Celsius). Take a large roasting and coat it with some oil, setting it aside later. Take up a large bowl and put in the ground beef, three stalks of celery, grated carrots, apple, eggs, bread, oats, wheat germ and tomato paste, mixing it all thoroughly with your hands. When it gets combined properly, divide this into four equal parts, making them into the shape of loaves. Put these loaves in the pan you prepared and surround them with the potatoes, rest of the carrots and celery. Cover the pan with a lid and place the preparation in the oven. Bake it for about 80 minutes in the preheated oven or until you are sure the meat has been cooked through. The ideal inside temperature of the loaf should be about 175 degrees Fahrenheit (80 degrees Celsius) on a meat thermometer. Allow the loaves to cool. Put one portion of the loaf with one-quarter of the vegetables into a separate food container and place in the refrigerator for storage. For serving your dog, give them about a third of the contents of any vessel, alongside every serving of kibble. We all want to eat everything that we love and still look, and even stay healthy. For that purpose, we tweak dishes and recipes as per our needs, so that they give us a higher amount of required nutrients and a lesser amount of unwanted fat or carbohydrates. Usually, you would prefer to get a high protein and low carb diet so that you can lose weight and gain some muscle or shape your body. If yes, then why should you exclude your beloved dog from this particular diet? They should also be getting a high protein and low carb diet in order to shed weight, gaining muscle and bone strength at the same time. Take the chicken and fry it in a pan. Drain out all of the fat after it is done. Cook the rice separately and steam the veggies, so they become tender. In a larger bowl, mix all the ingredients except the multivitamin tablets. Let the preparation get a little cold before you serve it to your pet. The canine multivitamin should be given separately because it cannot be given with anything that has been cooked or reheated. This is because doing so will result in the vitamin B becoming ineffective. You can add it in the very last of the moment. However, the more preferred way is to give it separately, on a daily basis. With just a 30 minute preparation time, this is one of the healthiest way of providing your pet with the best thing in the world of dog food. And that is not even the best part of this recipe. The most prominent advantage of this recipe is that you can tweak the recipe based on what you have available in your kitchen. Here is how you can prepare homemade raw dog food to give the best of both worlds to your canine friend. 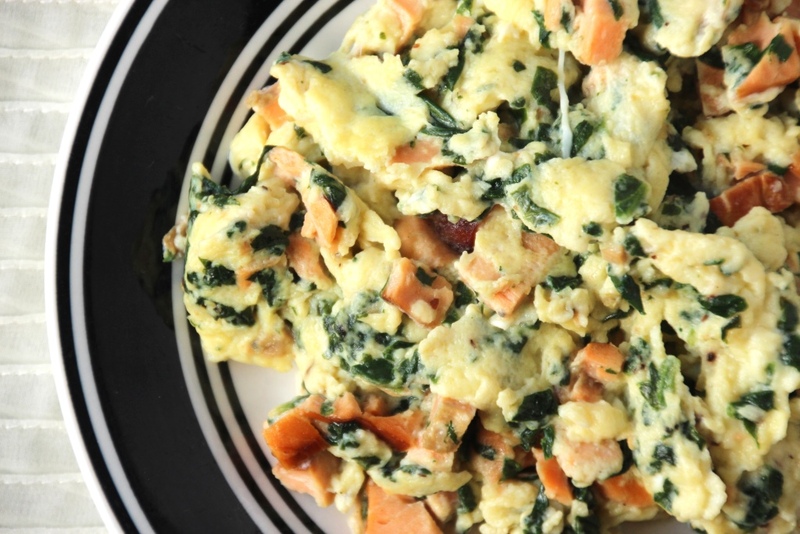 In a food processor, add the carrots, apple, and spinach. Work them until they get finely chopped. Open the lid and add in all other ingredients except the beef and process until they are thoroughly combined. Pour the formed mixture into a large bowl and add the meat to it. Now, with the use of a spatula or if you wish, with your hands, mix it all up. Take a baking sheet, line it with a parchment paper and keep it ready. Take the mixture and form it into patties of the size of your palm and line them up on the baking sheet. Freeze the patties until they get solidified. After they are done, store them in an airtight container or a sealed plastic bag and keep them frozen. The night previous to serving, remove the share of patties that your dog will consume and defrost them in the refrigerator overnight. Take out the fridge and serve them to your pet. There are just so many ways of feeding your dogs with their favorite meats. You can make them into the stew, casseroles, patties, or maybe even cakes. 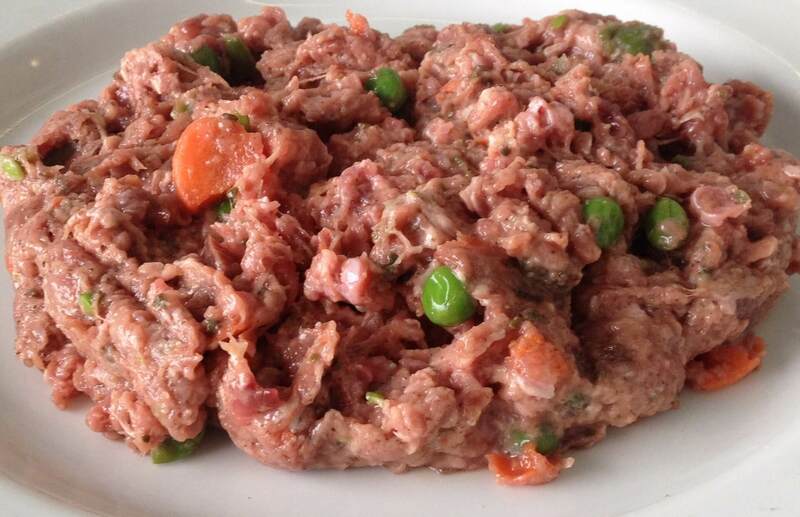 Yes, you can make healthy, fulfilling and tasty meat cakes for your canine friends that they will love immensely. So much so that they will keep following you whenever you start making them the food next time. These are made with a perfect balance of meat, veggies, eggs and some oats, making it all natural, beneficial and tastier than anything else that your dog might have ever tasted. Or maybe even you. 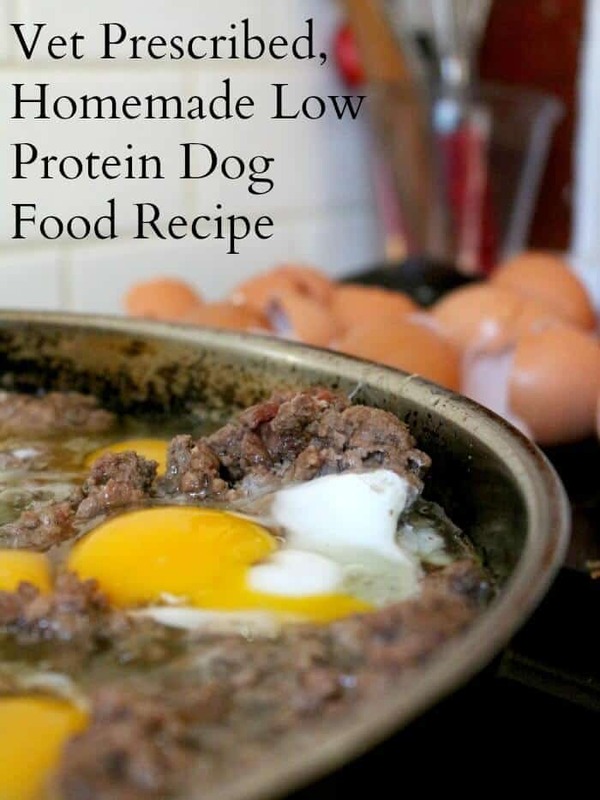 Yes, not only is this recipe amazingly healthy for your dog, it is also 100% human-friendly too. It is that dream perfect meal that you and your dog can munch on and enjoy together after you have experienced a long walk in the fresh air outside. Read on to know how to make these poochie meat cakes that your dog can share with you, too. Take a medium sized container and combine the rice with the water in it. Bring the water to boil over some high heat without the lid on, and cook for about 10 minutes. Reduce the heat to low and place the lid on the saucepan, letting the rice to simmer for the next 20 minutes. Take the saucepan off the stove and let it cool for a considerable time. With the help of a fork, fluff the contents and keep the pan aside. In a separate, large bowl, put together all the potatoes, carrots, eggs, celery, and the ground beef. Mix them well with each other using a firm spoon or your own hands. To this, add the olive oil, salt, rolled oats, and rice, mixing everything as you move forward. With this mixture, fill in the cups of the muffin tins that you prepared in the beginning. Pat them down, so the cakes become firm. Place the tins in the oven and bake for about 45 minutes or until you feel that the surface has set. Take the trays out of the oven and let the cakes cool on a wire rack for about 10 minutes or more. Turn the tins upside down for removing the cakes from them. Do this over a sheet of the aluminum foil by tapping the backside of each muffin tin to release the cake from the tin. You can easily store these cakes in a sealed plastic container or a bag and stow them in the refrigerator or the freezer. Make sure that you never serve these cakes to your dogs while they are still hot from the cook. 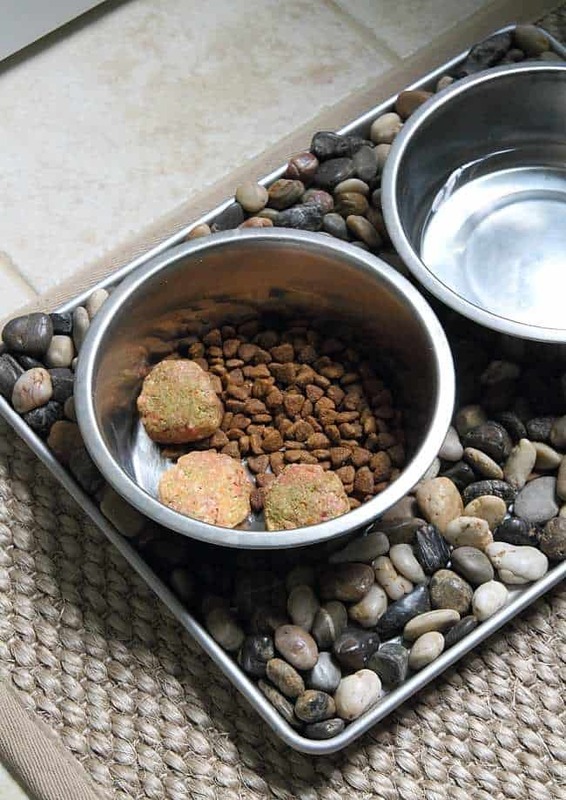 Whenever you do serve these to your pet, you can be assured that they really like what they are eating. There is no ideal food for dogs that you can feed them twice a day, and all days of the week. Variety is essential because it provides them with every nutrient that they need and they don’t get bored of what they are getting to eat. Fresh Parsley (Chopped) – ½ cup. You can also use 2½ tablespoon of parsley flakes. Prepare the oven by preheating it to 300 degrees. Prepare two large cookie sheets by spraying them with a nonstick cooking spray and keep them aside. Take a large mixing bowl and put the flour, milk powder, bone meal, wheat germ, parsley, and salt for mixing. In a separate bowl of smaller size, beat the eggs and combine them with the oil using a blender. Also, add the Worcestershire sauce. To the flour mixture, add water and mix it well together. To this, add the egg mixture and fold it correctly, so all the ingredients get combined thoroughly. Add the meat, sweet potatoes, dried apples and the spinach, and press them into the dough. On the cookie sheet (the best possible size would be 18 inches by 13 inches), spread the mixture and make it really flat and thin. Then, with the help of a knife, cut the dough into squares. Bake this for about 45 minutes to an hour. The kibble should be golden brown, and when you break open a piece, it should be crunchy and not at all doughy. When it is cooking in the oven, with the help of a wooden spoon or spatula, move the kibble around on the cookie sheet to ensure even cooking of the preparation. Turn your oven off and keep the door closed, letting the kibble dry out in the oven for 4 to 6 hours, or maybe overnight. When you take it out of the oven, the kibble will still be a little warm and moist. Place it on the cooling rack for about an hour or two, and wait for it to completely cool down before you decide to serve it to your dog. If you wish to know some variations of this dish, you can add the following ingredients for added flavor and nutrients – alfalfa leaf, barley, basil leaf, beets, broccoli, brown rice, carrots, flaxseed meal, green beans, Kamut, nutritional yeast flakes, peas, potatoes, rolled oats, rosemary leaf, and zucchini. Sometimes, it so happens that veterinarians recommend that you give your dog some low protein dog food. The reason can be anything, like old age or other medical issues. And this is something you cannot take lightly and have to get your canine on a low protein diet immediately. And there may be a chance that our dog does not like to eat the packaged low protein food. In this case, no need to lose hope as you can prepare a low protein diet for your dog at home too. A few things to remember for a low protein diet for your dog is to buy the cheapest and fattiest meat possible as you are aiming at the low protein and high-fat content. You will have to begin with separately cooking the beef. Make sure that it is cooked through before proceeding further with the preparation. Mix the rest of the ingredients in the beef and stir well to combine them. You can feed this to your dog twice a day. The more ideal way to prepare this is to cook the beef and add the eggs when it is almost cooked. Follow this by covering the pan and letting everything be ready and the yolks to be cooked through. You can divide this into equal portions and freeze them individually in sealed bags. At the time of cooking, just thaw the beef and egg mixture, and add the rest of ingredients before serving. Make sure that if you store the dog food after it is prepared, it should be consumed within 3 to 4 days. 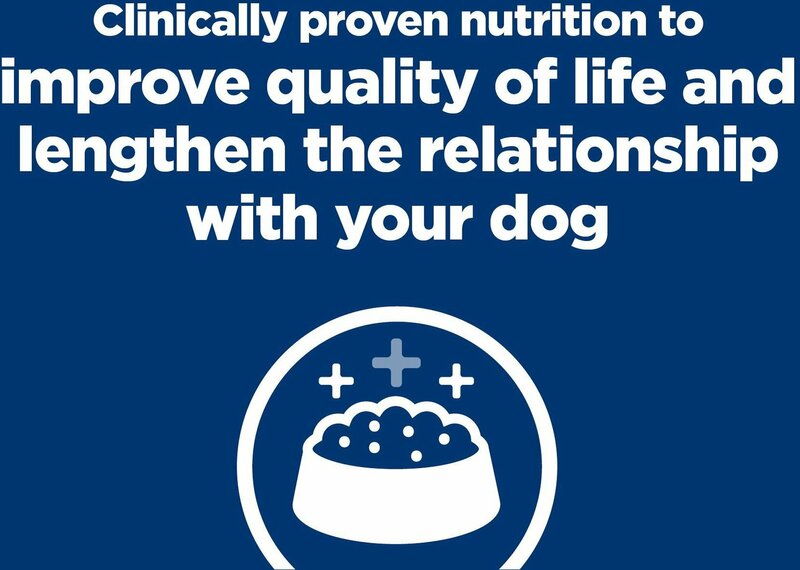 Also, ensure that you give your dog a good grade canine multivitamin. This is really essential because the homemade food is not enriched liked the packed or canned food, and so the supplementation becomes necessary. Take a nonstick skillet and pour the extra virgin olive oil in it. To the heated EVOO, add the spinach and salmon, and cook until they are both heated through. Add the eggs to this preparation and stir without stopping until the dish is thoroughly prepared, which will not take more than 2 minutes. Let the preparation cool down considerably before you pour it all into a dog bowl and serve it to your canine friend. Start preparing this recipe by preheating the oven to 350 degrees Fahrenheit. Take a large mixing bowl and put in all the dry ingredients, mixing them as you go. In a different, smaller bowl, mix in together the egg and the corn oil until they get combined. Into the bowl of dry ingredients, add some water and then add the egg mixture, mixing them well. The resulting batter will be a thin one. Divide the dough into baking sheets such as when you spread them evenly and adequately, the result will be a layer of about a half inch in thickness, as if for a pizza. Put the baking sheets in the oven, baking it for about 45 minutes. After that, cool down the kibble and divide it into small portions. You can split it into servings according to the requirement of your dog and store it in the freezer. If your dog is suffering from an upset stomach, his digestive system might not be able to take the regular food. You must be very careful about choosing the right dog food for his sensitive stomach at this time. This bland food diet is preferred by vets and must be given to the dog after fasting for 12 hours since diarrhea occurred. 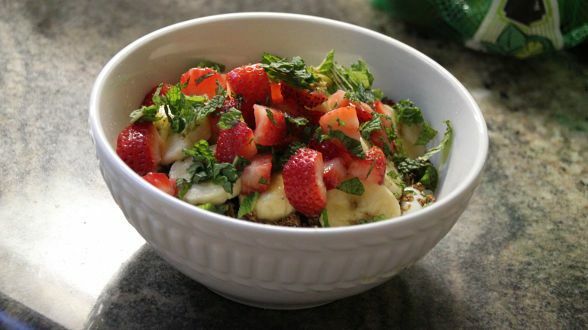 Mix both the ingredients in a bowl and serve in small quantities for 3-4 times in a day. Rice will help in firming up the loose stool, while white meat being rich in protein will serve as a rebounding ingredient for the dog. You can also add cottage cheese and yogurt to his diet, as it will add more good bacterias into his intestinal tract, and aid to the recovering process. If you have an underweight canine and looking for high-calorie dog food to make at home, this recipe is a perfect fit. This weight gain food is indeed good for those dogs that are undernourished and eat very meagerly. It’s high on fat contents, and thus your dog will put on weight in no time. There are two recipes below with the difference of quantity of the ingredients, as per the size of your dog. 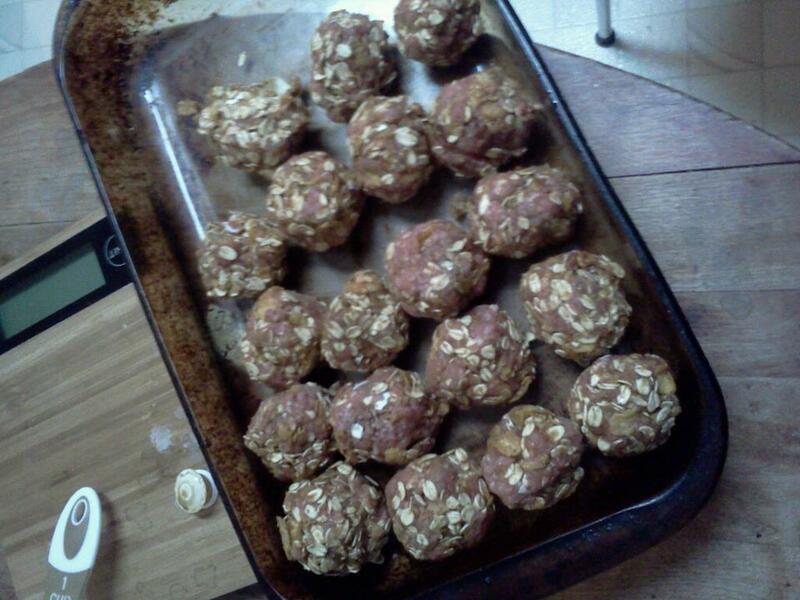 Mix all of the contents above and make balls of 1 inch each out of the dough, or you can also make rectangle patties. Put them into freezer bags, and serve them raw. Thaw them when you are serving individually. Keep a watch on the weight gain scale of your dog, and either cease or minimize the quantity, once it reaches the ideal weight. This one is an idle recipe for the pups that really like the cold treats. They will thank you for this frozen recipe, which is not only easy to make but also quiet low-ingredient and pocket-friendly. As the method consists of carrots and fruit juice, it will serve your canine’s vitamin deficiencies. Moreover, the yogurt will provide it with a sufficient amount of protein and calcium. Non-fat Frozen Yogurt (Plain) – 6 oz. Add all the ingredients in a blender, and blend until you get a smooth consistency. Take a spoonful of this mixture and drop them one by one in the cubes of the ice-tray. Put the tray in the deep freezer, until the mixture gets solid. Please ensure to use the non-fat yogurt only, if your canine is a bit overweight. Fruits are good for our health, and the same applies to our dogs too. 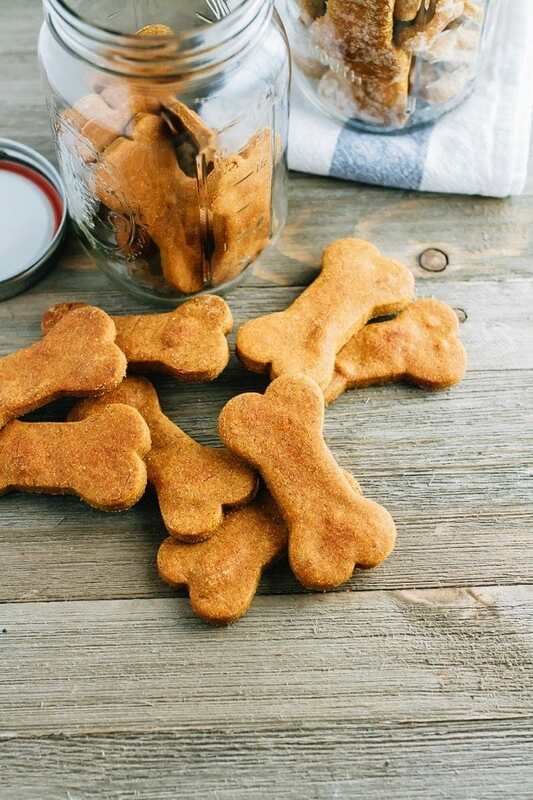 You can treat your dog with a dessert every now and then, and what’s better than an easy to cook recipe that contains ingredients which are rich in protein and vitamins. Fruit Parfait is a dish that is not only good for health but will also be liked by the pups. Add all the ingredients to a medium-sized bowl and blend them well until a smooth mixture is obtained. You can serve the dessert in less amount and can use for up to 7 days by storing in the refrigerator. Fish patty is a delight for dogs and to serve them with essential veggies makes it more beneficial for your canine. The dish will give your pet required nutrients and it will also like the taste of the fish with added vegetables and egg. Firstly, chop the carrot, celery, and potatoes into bite-sized pieces. Secondly, mix the drained salmon with flour and egg. 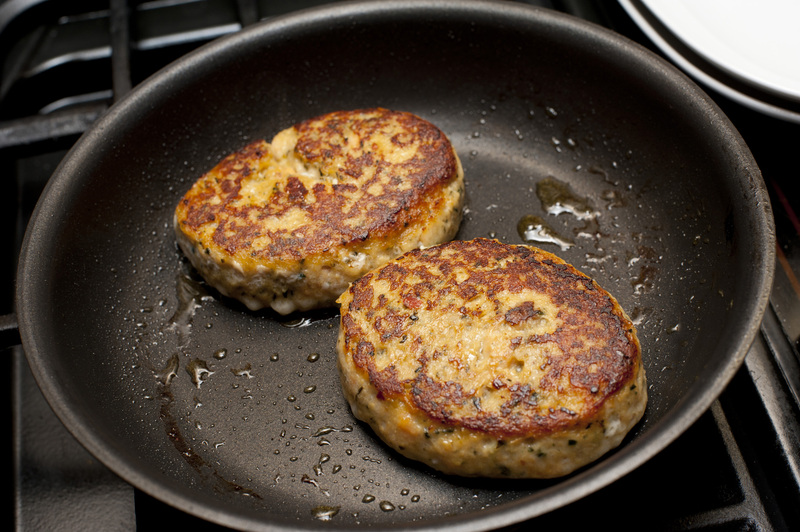 Fry the salmon in oil after cutting it into small patties. Once the patties are golden brown, take them out and stir-fry the vegetables for around 5-7 minutes. Serve patties with the vegetables to your pet. Each one of us has a craving for a smoothie every now and then but have we ever thought of our pets? They also get bored with similar food daily and that is why they might love the smoothie occasionally. Get all the ingredients and put them in a blender. Blend until the mixture becomes smooth for consumption. Dog biscuits might be a good option as a reward to your pets but do take care not to feed biscuits as a whole meal, as it will not be healthy for your dog. Preheat the oven at 350 degrees Fahrenheit and prepare a mixture of flour, egg and chicken pieces. Place it in the oven until the biscuits are ready. If your dog is diabetic and you want to avoid injections to keep the sugar level in control and keep your pet healthy, this recipe will certainly give you a sigh of relief. To maintain the body sugar levels, one has to consume the products that have a low glycemic index. This dog food recipe will not only fulfill all the requirements of your canine but will also prevent the sugar level from going up. Organic Pumpkin of your choice – 29 oz. Frozen Broccoli (cut into pieces) – 32 oz. 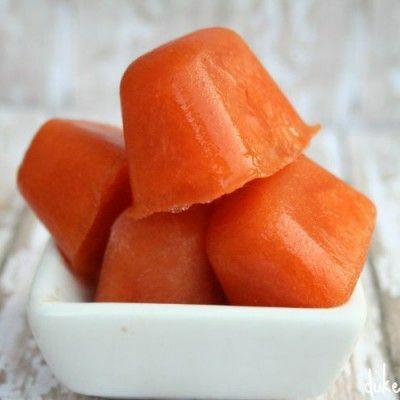 Frozen Carrots (Crinkle cut) – 32 oz. Frozen Green Beans – 32 oz. Frozen Spinach (Chopped) – 20 oz. Start the preparation by boiling water over high heat followed by adding chickpea lentil, brown lentils, black-eyed peas, barley and green split peas to it. After adding these ingredients, reduce the heat to medium. Add chicken breast, ground turkey, Pumpkin and frozen vegetables. Then, reduce the heat to low and occasionally stir before almost all the water is absorbed. Store the food to feed your dog multiple times. This dish a healthy option for the pets as the constituents available in the recipe help in preventing digestion related problems, keep the eyes healthy, provide shine and give added protein to the body. First of all, preheat your oven to 350 degrees Fahrenheit and mix peas, carrots and ground turkey in a bowl. 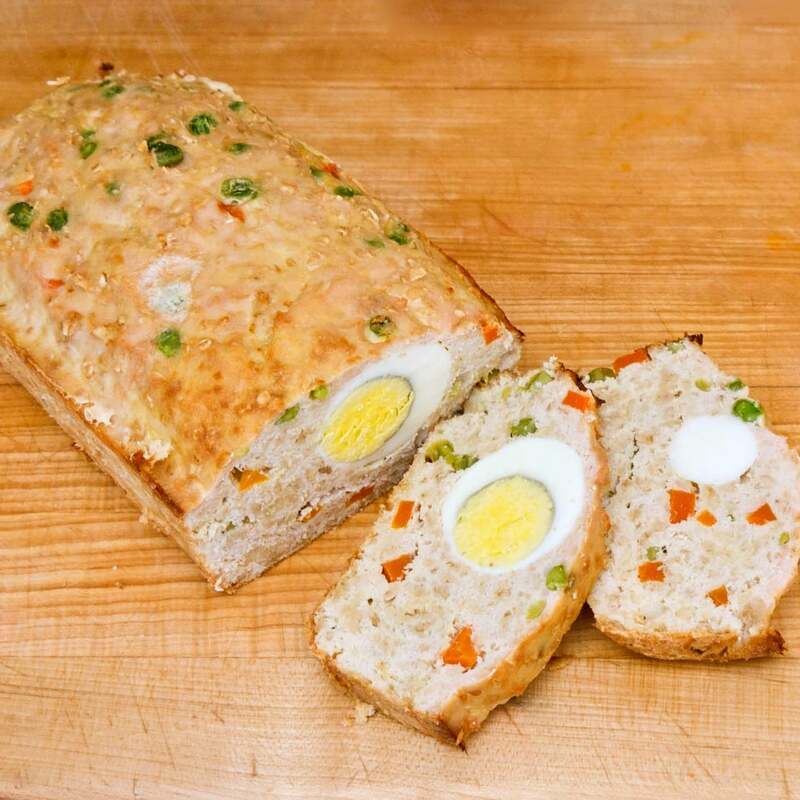 Add eggs and oats to it, and form a mixture in the form of a loaf. After that, add half of the mixture to the pan after greasing the pan with olive oil. Put the hard boiled eggs on the combination and add the remaining mixture to the pan, and bake for approximately 45 minutes. Cut pieces from the loaf before serving it to your dog. The amount of ingredients mentioned above will suffice around 12 servings. If your dog is suffering from arthritis and you need to make sure that he stays okay, there is a recipe for you. Instead of giving pain relievers and medicines to your pet, make them consume the food that will be good to aid arthritis. Alfalfa powder and other ingredients present in the recipe will help in treating the problems like pain and tiredness due to the disease. Cook your white turkey meat in a slow cooker until the temperature is around 145 degrees Fahrenheit or about seven hours. After cooling it down, chop into bite-sized pieces and store in a bowl. Now, make brown rice and brown the ground beef, mix the drained grease from beef to the rice. 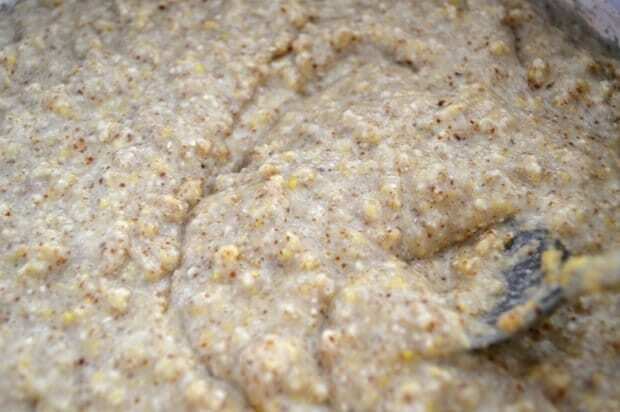 On the other side, combine all the vegetables with alfalfa powder and oats with warm water. Mix all the ingredients properly in a large bowl and then take out a portion to serve your pet and store the rest in the refrigerator. If your dog has some symptoms of gas or is suffering from diarrhea and vomiting, there is no need to rush to a veterinary doctor. Instead, you can make them Healing Mash that will give them a break from their regular heavy meals and give the digestive system some time to adjust. Protect your dogs from getting ill due to upset stomach and also save your carpets from getting stains due to your pet. 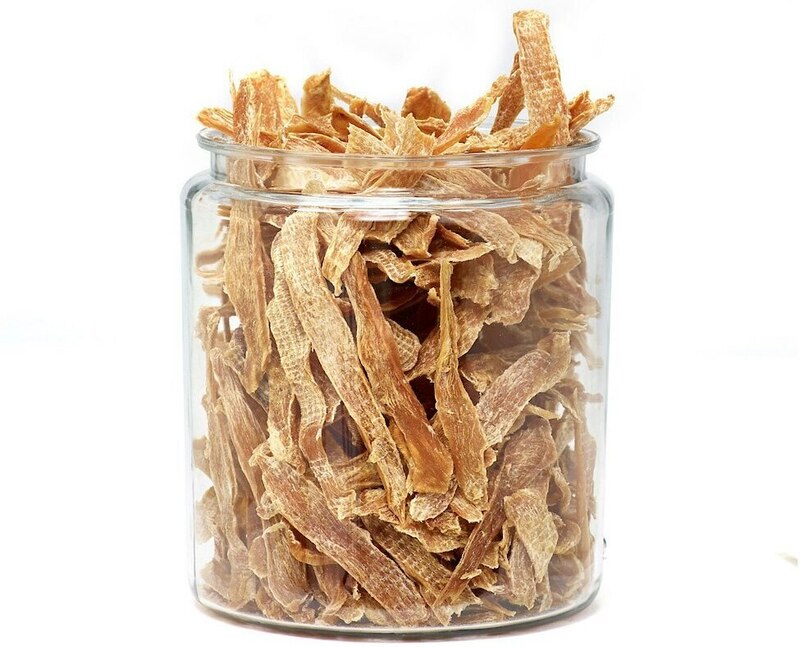 The ingredients used in the recipe will provide your dog with food having high fiber content which will firm up the soft stool and give stability to the digestive system. You can choose any of the three recipes according to your preference. You can decide the portion to be served as per the size of your dog. Cook white rice and shred the chicken into it with the warm water. Directly feed the mixture to your pet at the time of its regular meals. Mix both the ingredients and serve it to your canine at regular intervals. Start introducing the proper food after a few days of eating Mash. Cook the white rice and add canned Pumpkin and plain yogurt to it. Torn the boiled chicken into small pieces and add warm water to it. Mix all the ingredients and serve your dog. Continue the mean until your dog seems alright. The raw food is a good source of proteins and required constituents for a pet. You can make it into meatballs by freezing and then serve according to the need and diet of your dog. The quantity of the meatballs must vary according to the weight of your dog. Put frozen fish fillets, beef liver, veggies and Pumpkin seeds in the meat grinder. Add other ingredients including Honey, eggs, canned salmon, dried herbs and kelp powder while grinding. Make the meatballs and store them in the refrigerator for freezing. The meatballs can be used up to three months.